My first experience of the BeNe Ladies Tour Stage Race started with a flat out 3.9km Prologue. After leaving the Team Pursuit behind a few years ago this was going to be the shortest race I’d done in a while and true to form it was over in blink. I powered down the ramp and over the paved start, neogiating the roundabouts as I went, trying to keep the momentum up all the time. Turning and heading back down the course I knew I would be close to 5 minutes, especially with the tail wind present. I may have bottled the two remaining tight RABs but I wasn’t far off, finishing with a time of 5min14, sitting in 53rd place from 161 starters ready for tomorrow’s Queen Stage and the slighter longer (but not long enough) TT the following day! Stage 1 on paper looked to be the hardest with various exposed, narrow sections and a few cobbled climbs to contend with. The uneven and narrow cobbled climb known as the Molenberg was climbed twice along with the Rekelberg where I settled in well, keeping towards the front knowing that there would be splits before the finishing circuits. As it was there were splits with a 3 woman breakway leading the charge by 15 secs or so into the last finishing lap. Eventually Marianne Vos took the honours with myself comfortably in the bunch behind, not losing any time to the majority. A number of groups followed, clearly showing that the terrain of that stage had taken it’s toll on some! I finished up 47th and 51st in GC for the day. Friday’s racing greeted the riders with a split stage. 100km in the morning then a 10km TT some time in the evening depending on your GC position. Another warm day and another few sets of cobbles. Although these cobbles didn’t seem so vicious as yesterday’s, once out racing it soon became apparent that the wind was making up for that! A narrow road leading to a dead right turn into crosswinds and cobbles soon became my enemy. Once off the cobbles I turned left into a mighty headwind where each lap it strung out like scences I’ve only seen on the telly. Eventually the efforts and poor positioning lead to me falling into the second group until the end, losing time and places on GC. In Stage 2b’s short TT I clawed a few places back ready for the final stage which the following day consisted of a big kermesse. 9x13km laps on a slighty wider course lead to better positioning for myself. With the laps counting down and feeling relatively good, I started moving closer to the front. Everything came to a halt when I suffered a puncture approaching the final 13km lap. The bunch and sprint had gone but I still fought on through the cars to the finish once I got another wheel. By losing another minute on GC I shifted down to 85th overall from 160 starters. However I learnt a lot and will be better prepared when it comes to fighting conditions like Stage 2a again grrr! 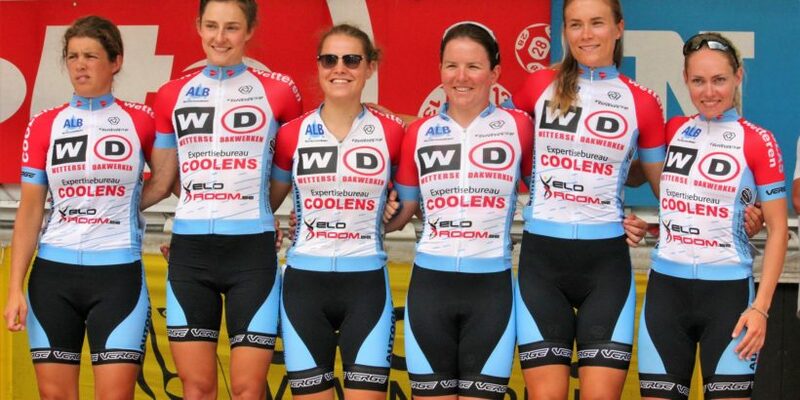 Over and out from Belgian racing for now but as always, I would like to thank the Womens Cycling Ireland Commission for supporting my travel in this event. Also to Autoglas Wetteren for the opportunity to race and the hospitality they provided. Finally in cycling, I would be nowhere without the continuous support and encouragement from my local bike shop and sponsor, Brotherton Cycles.